Australian dinner parties have changed over the past decade says a new Galaxy Research study commissioned by Meat and Livestock Australia. Over half of Australians (51 per cent) said they think dinner parties today are less formal and 32 per cent attend parties where everyone helps cook culturally diverse meal. The majority of hosts (61 per cent) plan their menu based of their guests’ dietary needs. Approximately 25 per cent of hosts are catering to gluten intolerances and 22 per cent catering to dairy intolerances. Over half (56 per cent) of Millennials host or attend dinner parties at least once a month while only 41 per cent of Gen X attends monthly dinner parties. Just 24 per cent of Baby Boomers go to or attend monthly dinner parties. The most popular topic of conversation at dinner parties for Millennials is gossip with 54 per cent listing it as the ‘hottest topic of discussion’. The favourite discussion point for Generation X is their children, while Baby Boomers like talking about travel. 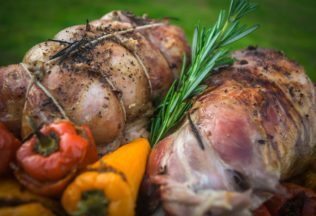 According to the Meat and Livestock Australia (MLA) commissioned study, 91 per cent of Australians say lamb is the “perfect dinner party meal”. Almost half (49 per cent) say lamb is easy to cook and 43 per cent report it is a versatile ingredient. Half of dinner party hosts use lamb in Italian dishes, 31 per cent in Chinese dishes and 25 per cent in Thai. The most popular way to prepare lamb is roasting with 63 per cent of Australians choosing to cook lamb as a roast. Nearly 40 per cent choose to slow cook their lamb and 32 per cent barbecue it. Baby Boomers are more likely to stick to just roasting their lamb while Millennials are more likely to try different cooking methods like smoking, stir frying or using minced lamb.